Members-only Innovation Practice Group visit to AMBER in Trinity College Dublin. IRDG is delighted to invite members to attend an Innovation Practice Group visit to AMBER in Trinity College Dublin and see the fantastic research capabilities, expertise and projects underway. This will be a great chance to broaden your thinking and possibly open new opportunities. AMBER (Advanced Materials and BioEngineering Research) is a Science Foundation Ireland funded centre that provides a partnership between leading researchers in material science and industry. It is jointly hosted in Trinity College Dublin (TCD) by CRANN and the Trinity Centre for Bioengineering (TCBE), in collaboration with University College Cork and the Royal College of Surgeons in Ireland (RCSI). The AMBER Centre directly impacts technologies and products for the ICT, medical devices, energy, biopharmaceuticals and industrial technology sectors. AMBER has a strong emphasis on linking industry to research programmes. At present, there are active research engagements with over 100 companies that includes large company partners such as Henkel, Depuy and SAB Miller, as well as SME’s such as Proxy Biomedical and Eblana Photonics. The centre delivers internationally leading materials research that will be industrially and clinically informed with outputs including new discoveries and devices in ICT, medical device and industrial technology sectors. 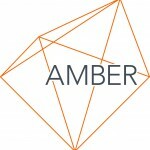 AMBER has a strong emphasis on linking industry to research programmes and the aim of the centre is to develop products that directly impact everyone’s quality of life such as the development of the next generation computer chips and new medical implants and pharmaceuticals that will improve patient care. AMBER brings together Ireland’s leading material science researchers working across the disciplines of Physics, Chemistry, Bioengineering and Medicine; with an international network of collaborators and companies. AMBER is committed to lowering the barrier for industry to interface with, and benefit from, a direct engagement with academia. AMBER has a professional industry team to support collaborative research programmes and a dedicated intellectual property group to ensure effective protection of IP and commercialisation of research. The industry team work with companies to identify and secure sources of funding to support innovation related activity. Engagement modes vary and are tailored to meet your company’s requirements, and include collaborative research, technology licensing, contract research, product and process development, materials analysis and advanced manufacturing support. AMBER facility tours (45 mins duration) will be available at 13:00 and 13:15 for those interested in seeing the facility and meeting the researcher and support staff.